Job application forms are a mandatory requirement while applying for any job. 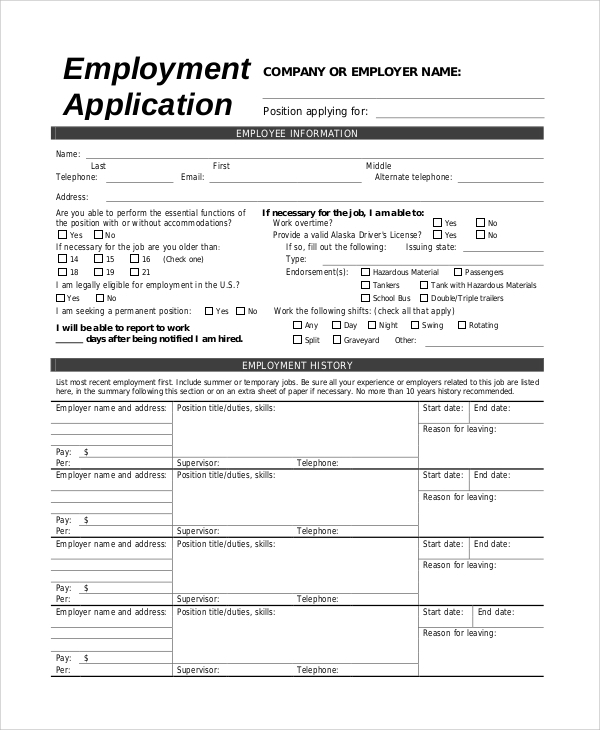 The following job applications will give you the exact idea about what a job application contains, what are the data you need to have in your possession to complete it and what are the declarations and statements the company wants you to know before your sign and mail them. The following JFree Job Application Forms are of different types depending on the kind of job you are applying for. 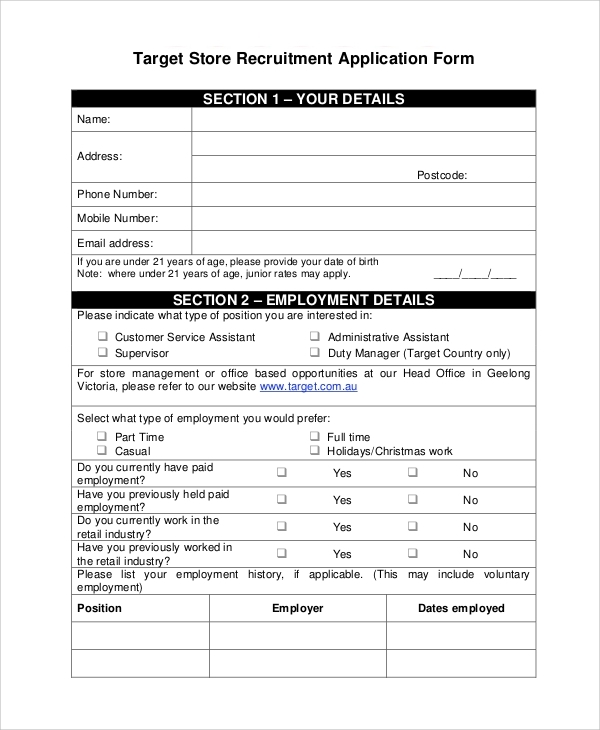 This is a sample job application form for any general job. It is a format that can be used to file an application in different companies for any position. It contains the standard provisions for name and address, job type, additional information like education, work expertise, references and much more. 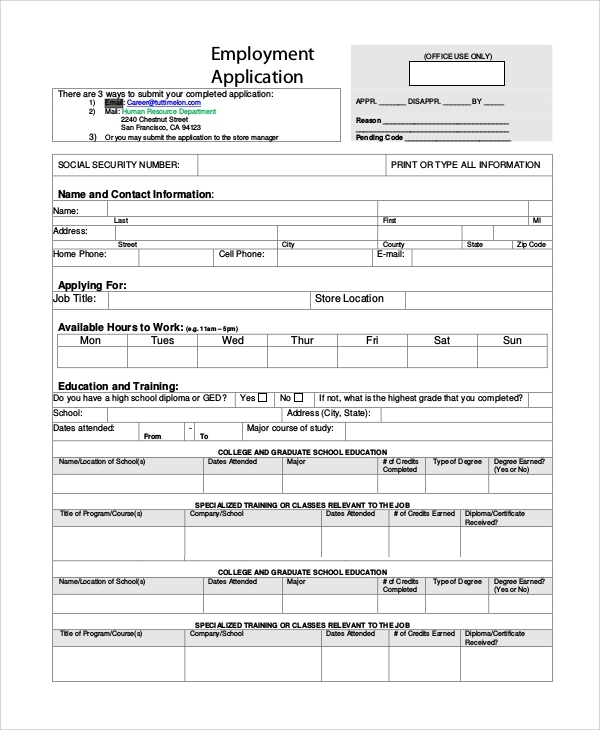 This is a Sample Job Application for any general job. It has sections for personal data, availability and preferences, preferable working time and location, past employment details, role requirement, and other necessary declarations. This is a job application that belongs to a particular company. These are a specialized application form to applying in a company who will make an assessment of your skills and qualifications and get you a job in a suitable position according to your abilities. 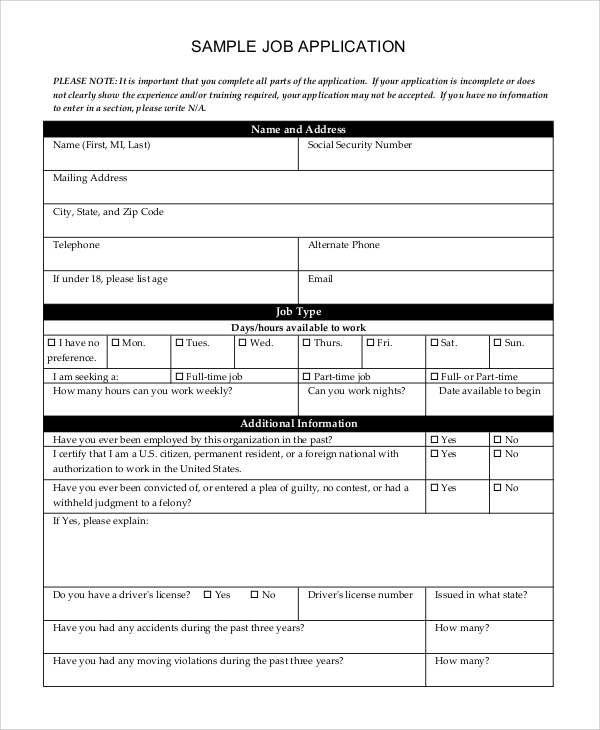 It is a 5-page job application form with eight sections to collect necessary information. The Job Application Forms will help to understand the data you need to give while applying for any job. There are target application forms that vary from company to company, but the maximum part stays the same. One can fill them up and store the data so that they can just copy and paste them to prepare your resume or fill other application forms. There are cover letter formats as well which sometimes need to be furnished with the application forms. 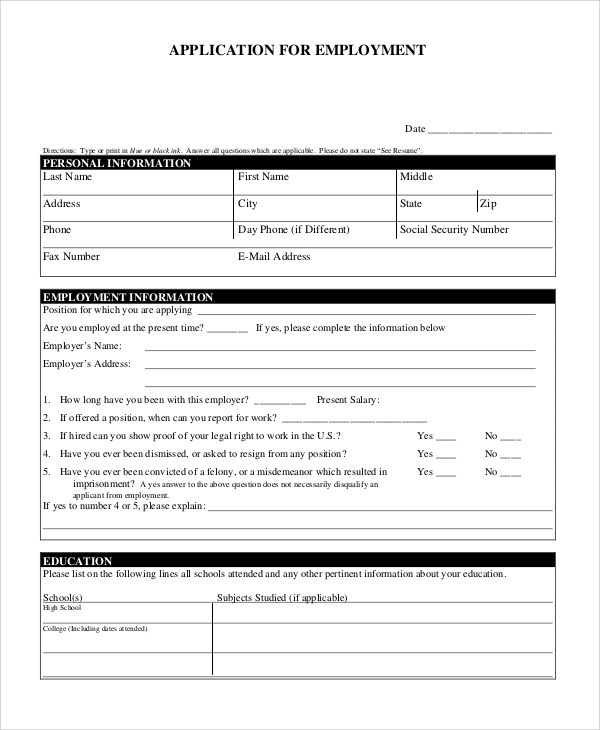 This blank job application form can be utilized to get a complete idea about the fields, and the data one needs to have to apply for any desired job. 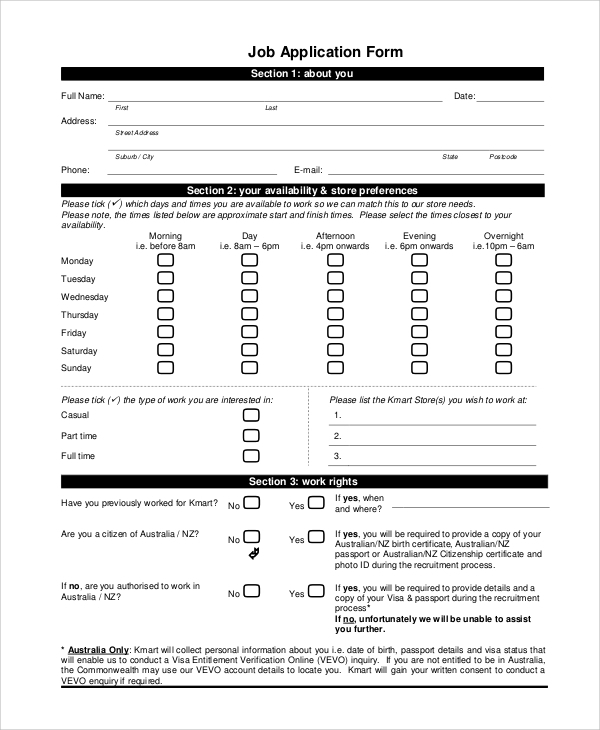 It is a standard form, and most of the job application forms are like this with a few changes. It contains provisions for personal information, employment details, education, references and others. This is a cover letter that goes with a job application form in most of the cases. 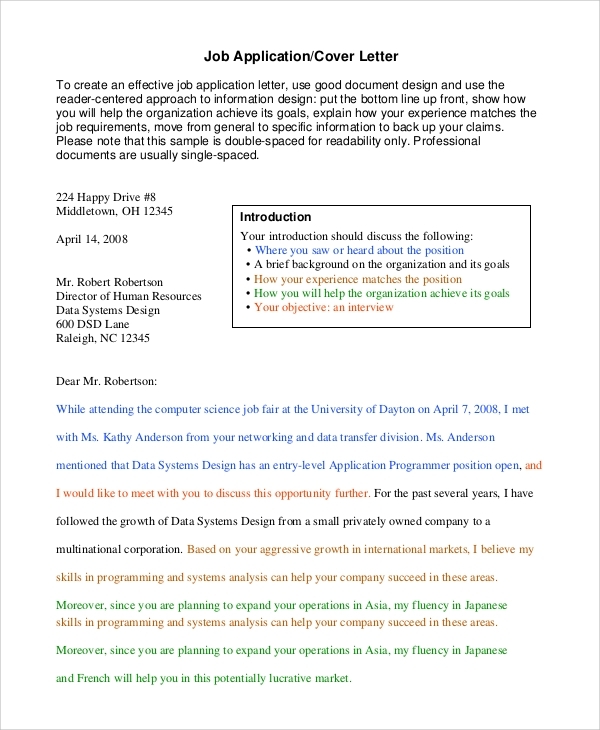 This sample will let you know how to write a proper cover letter that turns heads including what to write in introduction, body, and conclusion. It provides guidelines with examples. The targeted audiences for these job application forms are the freshers who want to know about the data they need to have to fill a job Application Forms. They are also useful for experienced professionals and employers to design specific job application for their companies. They are helpful for any professional to design their resume just like the way application forms look and in a proper flow. 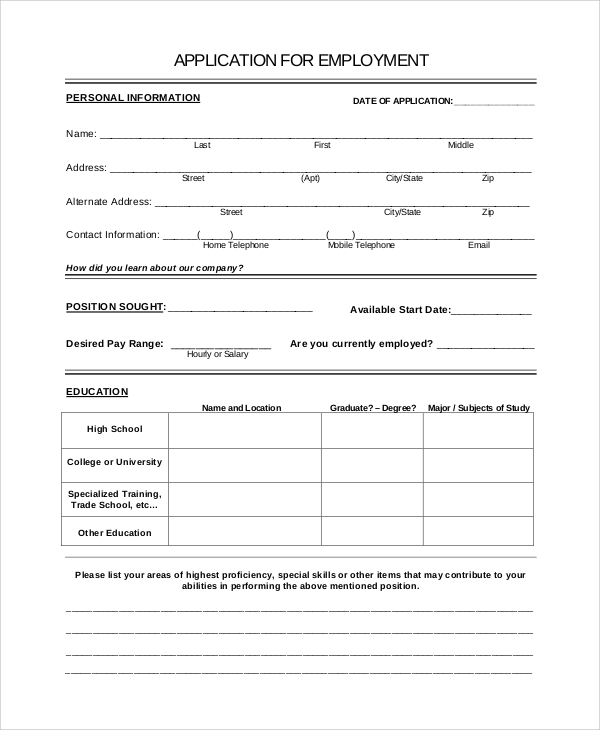 A Sample Employment Application Forms is pretty much similar to a resume only that it comes in a form format. The above-listed job applications are important for the freshers to understand the data and the information they need to have to fill the given fields and send them. Some of them come with cover letter samples and resume format that need to be sent with the job application form.